These guilt-free no-bake carrot cake protein bars will satisfy your sweet tooth but won't hurt your waistline! Over the past few years of prepping for competitions, I have consistently over indulged in my favorite desserts as soon as contest season concluded. My taste buds would explode in delight from the moist, sweet goodness of the super succulent German Chocolate Cake that my mother-in-law would make for my birthday each year or Organica Natural Food's amazingly delightful organic Carrot Cake. It is by far the best I’ve ever tasted besides the one I make at home, which I don’t do anymore since I’d eat the whole thing! The following is my Bad Girl Gone Good No-Bake Carrot Cake Protein Bar. Making this simple and healthier alternative of my sweet treat kept me from hitting Organica once for carrot cake this past season! Super impressive! Especially since I went there almost every day post prep week one in my first contest season. I know… bad girl! Mix all ingredients together in a large bowl starting with oats, carrots, whey, spices and flax. Then add almond butter, berries and nuts. Add water as needed to moisten mixture. Once thoroughly mixed, spread in 8X8 pan lined with Press and Seal Wrap. Be sure to cut wrap twice the size of pan so that you can cover mixture once it is spread evenly in pan. After you have wrapped mixture, freeze for several hours. Once frozen, remove from freezer and let stand for 2-4 minutes. Cut into 8 equal sized bars and wrap them individually or store in ziplock bags. Refreeze until about 5 minutes before you are ready to eat. 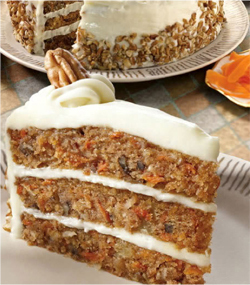 To complete the whole carrot cake experience (and be a little bad), mix 1/3 cup of organic reduced fat cream cheese and 1-2 packets of stevia and a teaspoon of vanilla extract. Spread a little on top of your bar and yum! Hope you enjoy it as much as I do! Stay tuned for my Bad Girl Gone Good No-Bake German Chocolate Bar Recipe! They are the bomb! *Photo included is of a carrot cake and not a representation of the actual protein bars.